We ate this so fast, I neglected to get more photos. This is just before it went in the oven. The holidaze rush is upon us and you want to feed your family hearty and nutritious without heading through the drive in or filling your fridge with Styrofoam take-out containers. Save a few bucks and make this meal instead. Literally, it can be ready in 30 minutes. You’ll need a big cast-iron skillet, your oven, and a cutting board and sharp knife. Super easy. You can cut up the bacon first and then while that cooks, cut up onions, then peppers, then Brussels sprouts, then the sausage. Or if you have a few extra minutes, get it all prepared before you start cooking and while you cook, enjoy a warm seasonal beverage with brandy. Preheat oven to 400 degrees. Take the bacon and fry up in a cast-iron skillet. Until it’s almost crispy. Remove the bacon from the pan and set aside on a plate lined with paper towels. Leave the bacon drippings in the pan and then put in onions. Cook for one minute. Stirring occasionally. Then add peppers. Cook the onions and peppers together for one minute. Stirring occasionally. Then add in the Brussels sprouts and cook between three and five minutes, also stirring occasionally. 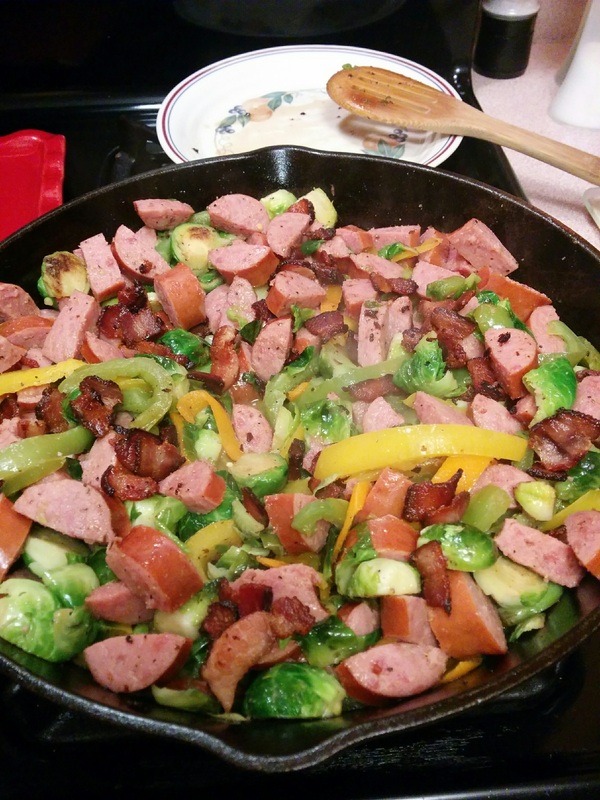 Remember, this is called Polish Stirfry. Then add in the sausage. Put a lid on the pan and cook for about two minutes, stirring occasionally. Take the lid off, stir again, add the bacon, add the salt, pepper, and paprika, stir again. Then put cast-iron pan without lid in oven for about 10 minutes until sprouts are fork tender. Serve immediately. If you’re in a super hurry, you don’t need to do the oven part — just stir-fry a bit longer on the stove top. But roasting all the meat and veggies together creates a yummier flavor.